The US has extended by 12 months a deadline by which UK passports must contain "biometric" data such as fingerprints. The move was welcomed by the Foreign Office and UK Passport Service, which had lobbied to allow British visitors entry without such passports. The extension applies to the US law requiring any passport issued after 26 October 2004 to contain biometric data. UK passports must be machine-readable under the US visa waiver scheme. British travellers can visit the US for up to three months without a visa under the scheme. The extension was passed by the Senate, and must be signed by President Bush. "We lobbied to have this deadline extended and will continue to work to ensure that any new measures are introduced with a minimum of disruption," the Foreign Office said. Under US law, all passports issued after 26 October 2004 must be machine-readable. 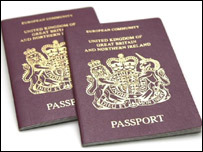 These have been issued in Britain since November 1991, and holders can travel to the US without a visa for the 10-year lifetime of the document. UK authorities had previously warned that they would not be able to issue biometric passports before mid-2005. The new passports could hold such biometric data as digital images or fingerprints - or a visa will be needed. Travellers with a visa will then have their fingerprints and photographs taken on arrival in the US. Before the extension was granted, a traveller with a new passport issued after October 26, but before biometric ones are available, would have had to purchase a visa at a cost of £67. More than four million Britons a year travel to the US, and hundreds of thousands of them would be affected by the arrangements as they currently stand. About 15.1 million tourists entered the US under the visa waiver programme last year.